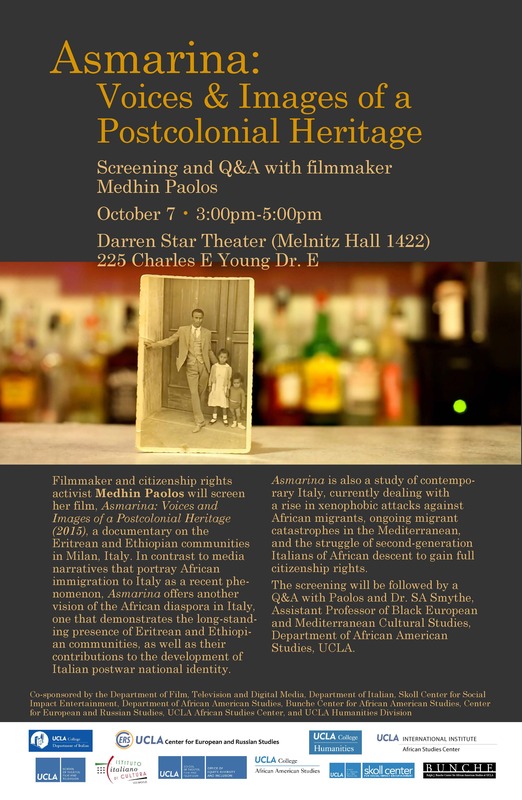 Filmmaker and citizenship rights activist Medhin Paolos will screen her film, Asmarina: Voices and Images of a Postcolonial Heritage (2015), a documentary on the Eritrean and Ethiopian communities in Milan, Italy. In contrast to media narratives that portray African immigration to Italy as a recent phenomenon, Asmarina offers another vision of the African diaspora in Italy, one that demonstrates the long-standing presence of Eritrean and Ethiopian communities, as well as their contributions to the development of Italian postwar national identity. Asmarina is also a study of contemporary Italy, currently dealing with a rise in xenophobic attacks against African migrants, ongoing migrant catastrophes in the Mediterranean, and the struggle of second-generation Italians of African descent to gain full citizenship rights. The screening will be followed by a Q&A with Medhin Paolos and Dr. SA Smythe, Assistant Professor of Black European and Mediterranean Cultural Studies, Department of African American Studies, UCLA.